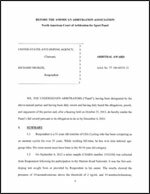 The United States Anti-Doping Agency (USADA) announced Wednesday the decision by a three-member panel of the American Arbitration Association (AAA)/North American Court of Arbitration for Sport (CAS) arbitrators finding Barney Reed, Jr. of New York, an athlete in the sport of table tennis, committed a doping violation involving for an elevated level of 19-norandrosterone, which is a metabolite of nandrolone, norandrostenedione and norandrostendiol. Reed, 24, tested positive at 2001 North American Championships in Fort Lauderdale, Fla. on July 6, 2001 for an elevated level of 19-norandrosterone, an anabolic agent, which is a prohibited substance under the International Table Tennis Federation (ITTF) rules and The Olympic Movement Anti-Doping Code. ITTF is the international federation for table tennis. Reed was suspended for two years from competition, beginning on July 6, 2001, the day of the positive test result. USA Table Tennis, the national governing body for the sport in the United States, will carry out the sanction. In addition, Reed will be disqualified from all results obtained since July 6, 2001, including a third-place finish in North American men’s doubles and fifth- place finish in North American men’s singles at the 2001 Northern American Championships. Reed has continued to compete throughout the adjudication process. This is the 11th sanction issued by USADA in 2002. USADA became the independent anti-doping agency for U.S. Olympic, Pan Am and Paralympic athletes on Oct. 2, 2000.